Podcast Chapters for Steel Episodes! Can I view chapters within each episode or listen to individual segments? Yes! Starting February 18, 2017, all future episodes will have chapter breaks so you can listen to individual segments of the program. 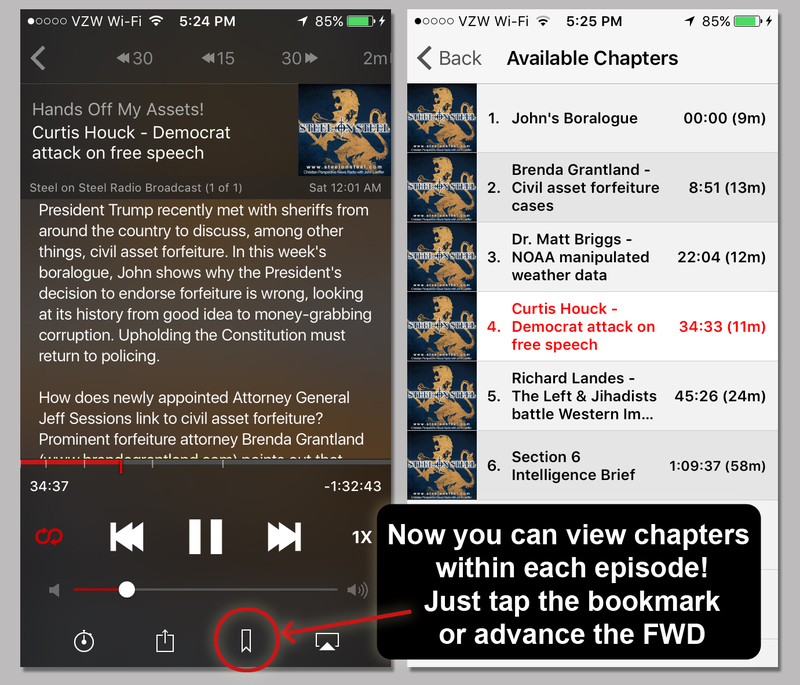 The chapters function is best experienced in Downcast for iOS, (shown in the image) but should work in most podcast apps that support chapters, including Podcast Addict, RSSRadio and others. To view the chapters, first download an episode within the app and then tap the bookmarks or chapters icon. Click the image to view larger. I have app Downcast but when I try to download I get message “error downloading “. I’d be happy to assist in troubleshooting the issue. First, be sure you are connected to a good wireless internet connection or strong WiFi like your home or office internet. Second, you need to be sure your login info is correctly entered into Downcast’s settings page. remember, your Steel on Steel login credentials are case-sensitive. 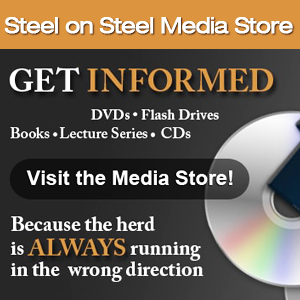 **To view or change your stored login info for the podcast, tap the Steel on Steel podcast icon in the main screen. On the next screen, tap the Gear icon on the bottom right. Go all the way to the bottom of the Settings page. Under Login Credentials, you can edit your login info. If the podcast won’t play or if you think the settings are incorrect, you can always just delete the podcast from the main screen and set it back up. If you still can’t play other Steel on Steel episodes in Downcast, it may indicate an issue with the app itself. Please uninstall and reinstall Downcast and follow the podcast setup instructions at our Podcast Help Page. Lastly, if the file will not play, use the browser on your device to login to Steel on Steel and verify you can play the file there. I hope this helps you with the issue. Please let me know if you still encounter trouble. Thanks for your support of Steel on Steel!